Feedback: How was it for you? Would you be able to help? Have I created a 3D Cast order for you recently, or in the past? 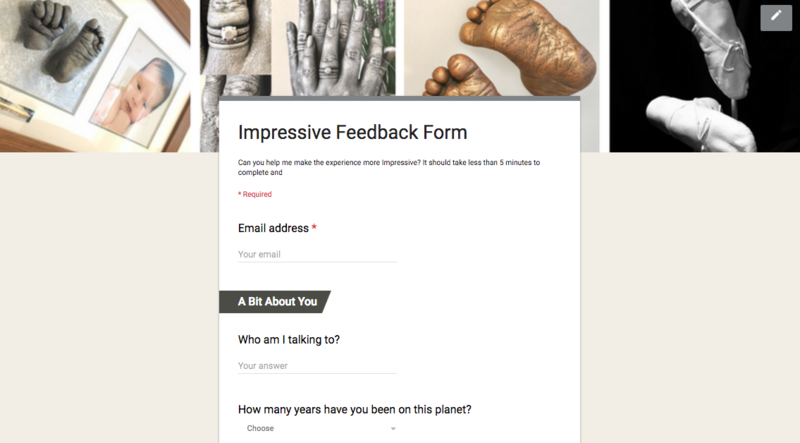 Could you take 5 mins to complete an online feedback form? Why am I asking for feedback? That’s easy. I want to make YOUR experience even better! It’s not just about how I think things are going…it’s important to know what YOU think. Was there anything that could be explained better? Could my website be easier to find the answers that you need? Was my coffee crap? Asking for feedback is not about asking for flattering comments and being told I’m amazing (feel free to do that too of course). You might be a little surprised to read the questions that are in the form, but they are relevant to what I am aiming to do with my business, and the responses I get will help with this. It should only take 5 minutes! I’m not fussy about spelling mistakes or punctuation. All questions are completely optional but the more you can tell me the more it will help. None of this will be shared without your permission, and most of it is purely for my own research and development. If you can give me 5 minutes of your time, I’d be Impressively grateful. Click HERE to complete the Feedback Form.